EXO002 | pro-CDR | 2009 | SOLD OUT! The Icicle Lectures Vol. 1 is the first episode of a collaboration between Feu Follet mastermind and Ex Ovo co-founder Tobias Fischer and Finnish composer and pianist Miina Virtanen. The Icicle Lectures Vol. 1 is the first episode of a collaboration between Feu Follet mastermind and Ex Ovo co-founder Tobias Fischer and Finnish composer and pianist Miina Virtanen. Premiered live to great success in Dresden in February of 2007, it embraces elements from Classical Music, Ambient and contemporary composition in one continous, challenging, yet emotional piece. After his debut Toi Et Le Son (on Einzeleinheit) in January 2006 and an ankle-deep march through a mesmerising stream of foggy sounds Feu Follet has arrived at the frozen lake of 2007. The realisation of this album was one of those little miracles life sometimes hands us. In his sidejob,Fischer also writes for the house journal of a large call center located in Münster. It caught his eye that there was an ad in each each edition for CDs with piano music and he decided to check it out. Only a couple of months later The Icicle Lectures Vol. 1 (which bases on Virtanen’s ”Silence Thoughts II”) was a fact. The Icicle Lectures Vol. 1 sees Fischer combining the glacial drones of the predecessor with the warm radiating piano drops of Finnish discovery Miina Virtanen. The end result is an airy, hardly tangible composition of removal and recurrence. Like feathers falling down on an icy surface in slow motion. "Looks like working in sub-human conditions brings nice side effects sometimes. While Tobias Fischer (aka Feu Follet) was intent in his writing job on the house journal of a huge German call center, he noticed repeated ads for piano music CDs. He checked them out and got in touch with Miina Virtanen, whose instrumental piece "Silence thoughts II" is at the basis of this collaboration, a very tranquil record featuring two tracks. In the first, played by Virtanen alone, an uncertain flute introduces pianistic phraseologies that border on the new ageish, very melodic and relaxing although not really saccharine-imbued (Tim Story is not too far away). The long suite that follows raises the bar quite a lot: fragments of Virtanen's playing get processed and looped to create a mixture of minimalist ambient and mantric reverberations and arpeggios, exploiting the natural resonance of the instrument. Without throwing La Monte Young and Terry Riley out of their bed, as this music's depth is not on par with those composers, the overtones caressing the air show respect for the audience. If you choose the right moments, this CD reveals a degree of seductive power with repeated listenings, its absence of emotional peaks notwithstanding. But you have to live in a silent place and avoid headphones, or it will make no sense at all." "Nice surprise here from Ex Ovo, the ‘new label for drone music and dulcet atmospheres’ as they style themselves. Although an epithet like that comes close to a description you might find printed on a pack of Sainsbury’s Taste The Difference Jersey double cream with a hint of brandy, I was very taken with one of these on initial spin. 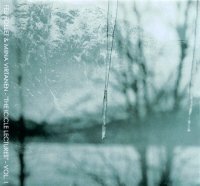 The Icicle Lectures Vol 1 by Feu Follet and Miina Virtanen contains a 34:00 title track which carries some overtones of Popol Vuh – quiet, simple piano figures and delicate, spectral dronework. Most absorbing. Also in Ex Ovo’s package was I, Mute Hummings, a compilation of nine drone pieces from contributors Keith Berry, Fear Falls Burning, Troum, Jeffrey Roden, Paul Bradley, Richard Lainhart, Column One, and others – Berry’s is the only name familiar to me. As the world knows I love a good drone, and it’s interesting for me after ten years of swimming in drone music to perceive the range of different approaches that people find to this apparently ‘simple’ way of working. 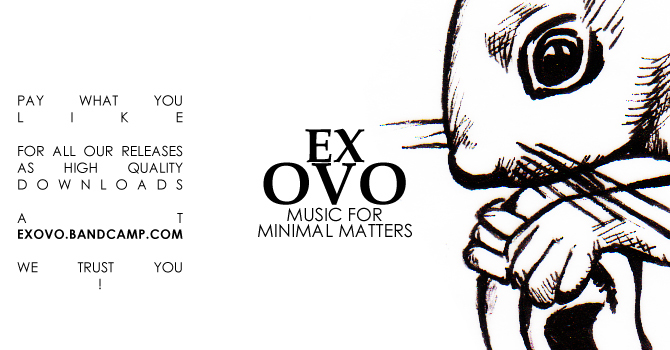 Ex Ovo seem to favour the wispy and ethereal mode, with slightly mystical overtones; I suppose for the full effect you need to reach for your Herman Hesse novel with one hand and a glass of chilled Chardonnay with the other." "It is in the first days of spring that the Feu Follet & Miina Virtanen CD found its way into my CD player. Although it’s not really hot outside it is warm enough, or may be it is better to say a comfortable coldness, to open doors and windows. When I listen to the first track ”Silence Thoughts II” written and composed by Miina Virtanen I wonder if the birds I hear come from outside or that they are mixed in the music. When the piano track ends I still hear the birds sing and I have to realise they come from outside. This beautiful piano track really gives me the feeling of spring. The second track "The icicle lectures- vol.1" has also a lot of piano, but here Tobias Fisher makes his contribution and added a lot of ambient feel to the music. He stretches the piano chords endlessly into drones and made them sound like blooming blossoms and flowers to open while the piano tones Miina plays sound like dew drops falling from the flower leaves. This makes you feel like on a Sunday morning. Then Thobias’ music is played backwards which gave an unexpected alien element to the music. Despite the title “The icicle lectures” and the icicles on the cover this music give you the feeling it's spring. Perhaps cold spring mornings with frozen flowers at your windows but certainly it is spring on this album, you can almost smell it, or am I just too much in the mood for spring? This Album is pretty easy too listen to. Slow evolving melodies and heavenly piano patterns. Soft drones with a hint of melody encapsulated. The drones are almost icy which connects perfectly to the title but also have a warm and comfortable feeling. I even have the idea that the birds outside are singing because of the CD. In anyway the music makes me more aware of the birds. This is a heavenly ambient CD and feels like a relieve next to al those pretentious music I hear to often. We al know the term Dark Ambient but if there is something like Light ambient this is the thing. (8/10)"
"The story behind this release is that Tobias Fischer - the man behind Feu Follet - saw an ad for Finnish composer and pianist Miina Virtanen's CDs in a magazine he writes for. Within 2 months he had contacted Virtanen and "The Icicle Lectures Vol. 1" was reality. Included on the CD is a 7 1/2 minute track of Virtanen's piano music which Fischer then takes and turns into a lengthy 34 minute soundscape. Virtanen's track starts out gentle and sparse, slowly building in emotion and intensity as it progresses. Largely composed of Virtanen's own music played on piano, "Silence Thoughts II" is a melancholic and expressive exploration of thoughts and feelings set to music. Sometimes quite gentle and heartfelt and at others impassioned and anxious, "Silence Thoughts II" builds in feeling as it slowly moves towards it close. Using Virtanen's track as the basis for his own composition, Fischer reinterprets the mood, feeling and emotion of her original piece and adds his own touches to augment and develop the concept. Taking elements of the original track, Fischer opens "The Icicle Lectures Vol. 1" with a gentle piano theme, almost like water dripping in an isolated pool. Sometimes adding electronic backing to Virtanen's playing to provide extra atmosphere and sometimes concentrating solely on electronic drones and sparse, almost non-existent tones, Fischer explores the ideas presented in the original track and expands on them in his own style. Often spacious, gentle and minimal, Fischer combines the gentlest of electronic tonal drones with excerpts of Virtanen's piano playing to create an emotive yet serene and atmospheric ambient piece that is beautiful, sad and calming at the same time. Occasionally exploring more psychedelic and hypnotic expression "The Icicle Lectures Vol. 1" is predominantly themed around ambience, mood and emotion with a sense of open spaces and freedom throughout. Always subtly changing, whether in tone, mood or style, "The Icicle Works Vol. 1", is a carefully crafted piece of ambient listening music. "The Icicle Lectures Vol. 1" follows Fischer's debut "Toi Et Le Son" for the Einzeleinheit label in January 2006 and picks up on the themes introduced by that album. Subtly shifting drones and absorbing ambient soundscapes are Fischer's speciality it seems and it will be interesting to hear more from him in the future. Virtanen is also a talented musician whose music plays a key role in the mood, emotion and scene setting created by the music presented on this album. (8/10)"
"Music by Feu Follet was reviewed before, as Tobias Fischer, the man behind the name, is also the man behind Einzeleinheit label, sending all of their releases to here. He also writes for the Tokafi webzine and is one half of an electronic duo called Suneaters. That's a different story. Here however he teams up with one Miina Virtanen from Finland, now residing in Munster, Germany. She plays the piano and has released two albums privately of her work. She got hooked with Fischer and together they made 'The Icicle Lectures Vol. 1'. It opens with a piece by Virtanen, solo on the piano. Music of stillness. Romantic but not kitsch. Satie meets Feldman. That sort of thing. The longest piece, thirty four minutes, is a collaboration between Virtanen and Fischer, which is by far the strongest work Fischer made so far. Chilling electronics that play a highly modest role in the music, with just a refined bit of Virtanen's piano playing. A bit of reverb adds that extra ambience. I am strongly reminded of the two albums Brian Eno made with Harold Budd in his ambient series, 'The Plateaux Of Mirror' and 'The Pearl', but then captured in one long track. It's a great melancholic and atmospheric music, perfect for a late night listening session. Curious about the next volumes!"